Birthdays create instant connections when two people have them in common. My best friend, who I met in second grade, has his birthday five days before mine. When I was growing up it was something I wanted other people to know. I would say, "This is my best friend, Craig. We love to play basketball together and our birthdays are only five days apart." This week, a friend whose daughter is in my son's preschool class said her birthday was in March. I said, "Cool. March? Me too! What day?" Her birthday was closer to the beginning of March and mine is on March 29, but it was still neat to learn her birthday was near mine. Today is my oldest son's birthday. He is 7! He was so happy find out that he shares his special day with author and illustrator Susan Meddaugh. 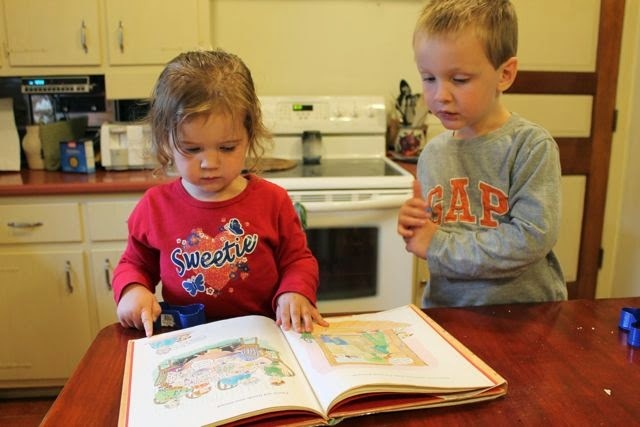 He had already made a connection with Susan because he loves her books about Martha the talking dog. Now, the connection is that much stronger. The next time he sees a friend reading Martha Speaks he can say, "Susan Meddaugh wrote that book. She has written many other cool books, but that is my favorite. The best thing is that we share the same birthday!" Susan Meddaugh is the author and illustrator of many children's books including Martha Speaks, Beast, and Cinderella's Rat. Before creating her own books she worked at a publishing company for ten years as a designer, art editor, and art director. She illustrated her first book, Good Stones by Anne Merrick Epstein in 1977 and then decided to leave the publishing company to work on her own. 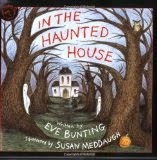 She successfully published many picture books in the 1980s and one of our favorites in 1990, In the Haunted House by Eve Bunting. "I initially did just want to illustrate, and did illustrate books for authors as well as my own. But over time, I've discovered that I can't separate writing from illustration, and do not want to." (2Wired2Tired). In 1992, she published Martha Speaks after her seven-year-old son (Hooray for 7 year old sons!) 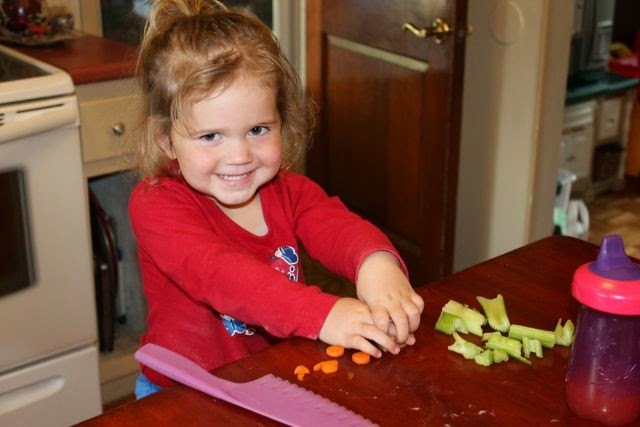 asked her while eating a bowl of alphabet soup,"Mom, if Martha [their dog] ate alphabet soup, would she speak?" (Baristanet). Susan described this experience with her son as an "A-ha! moment." (PBS on YouTube). She went to work on the story, used her imagination, drew her "drawable" dog Martha, and created a series loved by thousands, maybe even millions of children. Martha Speaks is also a successful television show for PBS. Now you can enjoy Martha in chapter books, a graphic novel, and beginning readers too! 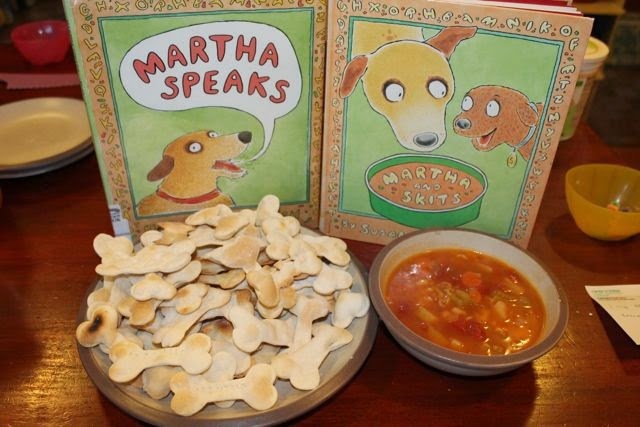 The best way to bring the books about Martha the talking dog to life was to make alphabet soup, but I thought baking homemade crackers to eat with the soup would make our dinner extra special. 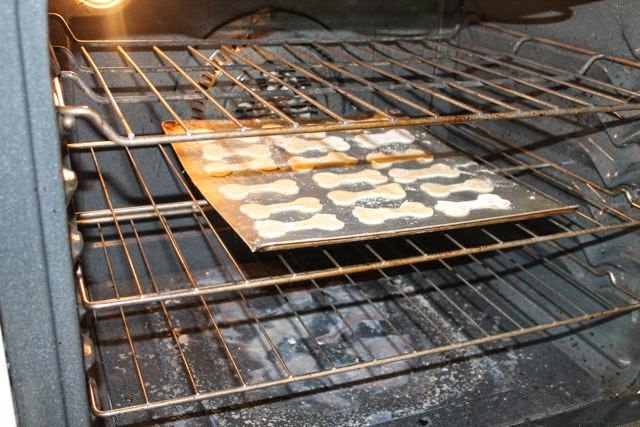 Last week, I found a delicious homemade cracker recipe that I wanted to try again. (Click here to get the recipe). 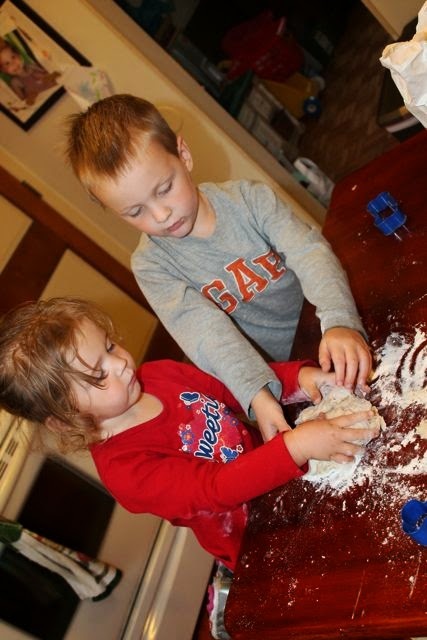 I gathered all the ingredients (flour, salt, sugar, baking powder, butter, and water) to make the crackers while my youngest two children looked through our Martha books. 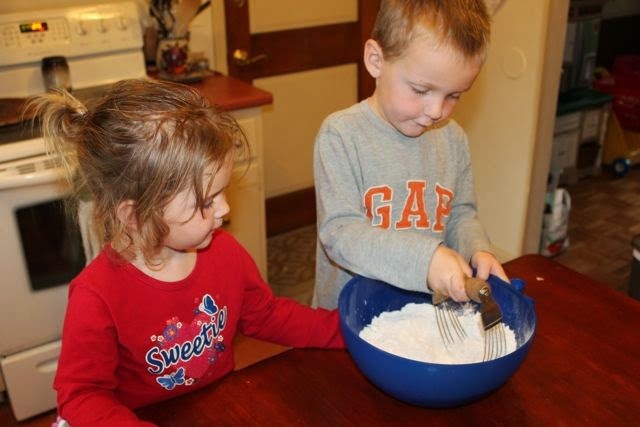 They took turns cutting the butter into the flour. 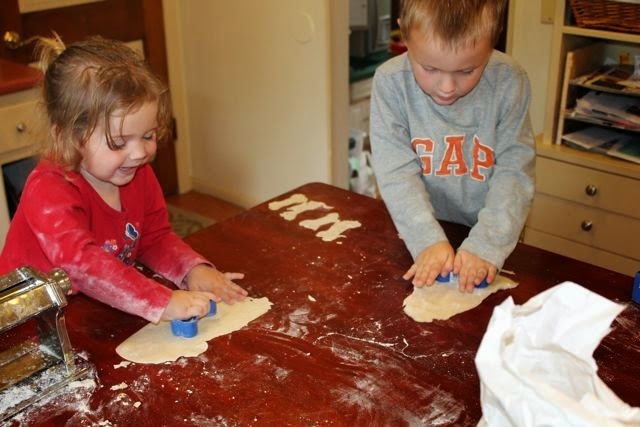 We prepared the dough in the electric mixture and then they took turns kneading. 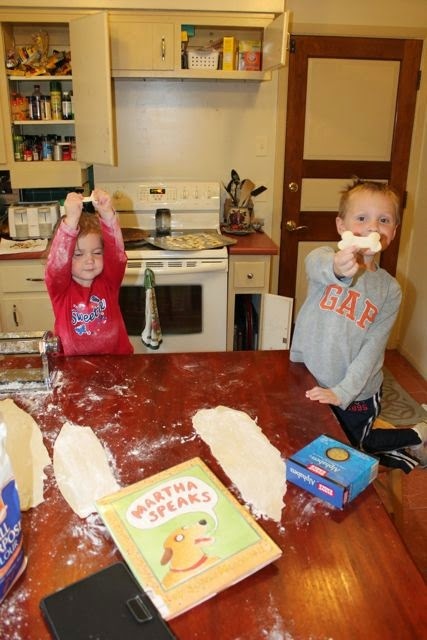 We had an opportunity to read Martha Speaks while the dough rested for 10 minutes. 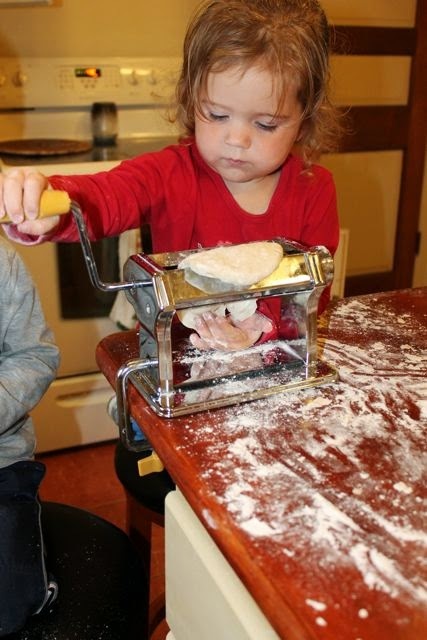 We used our pasta machine to roll out the dough. 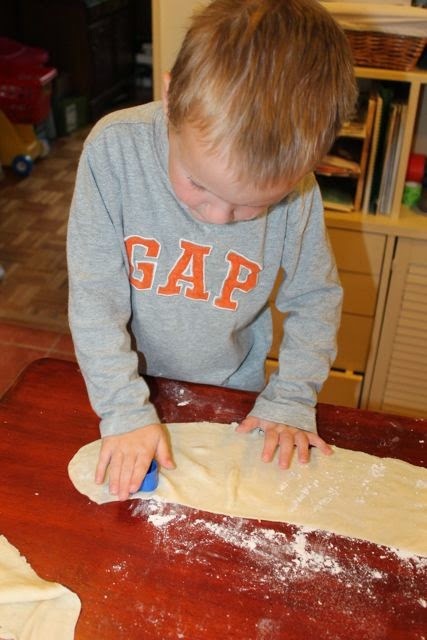 We ran the dough through on setting 7 and then again on setting 2 to make it really thin (almost see-through). 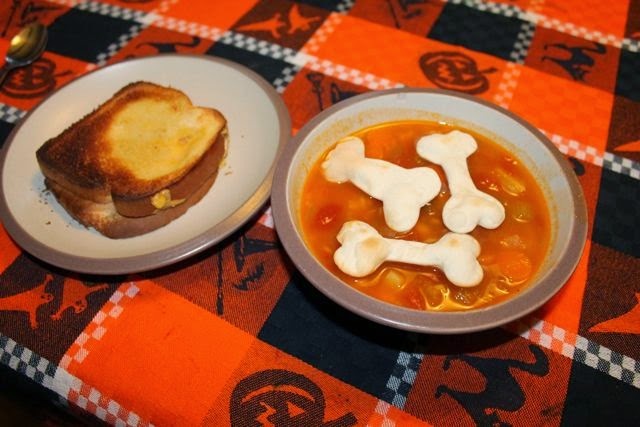 We purchased dog bone cookie cutters at Joann Fabrics for only 99 cents. They are also available on Amazon for a higher price. I bought two cookie cutters to make sure we didn't have any fights! Smiles were all around. 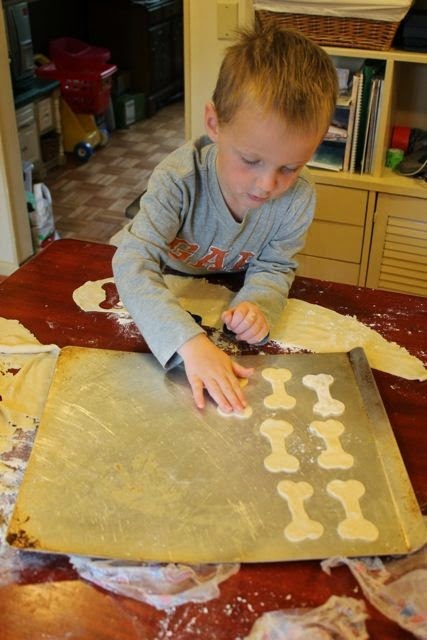 My son carefully arranged the dog bone cracker cut-outs on a cookie sheet. We baked them for 6 minutes at 450 degrees until they were golden brown. I rotated the cookie sheet half way through to allow for even baking. I forgot to pierce the dough with a fork before baking. 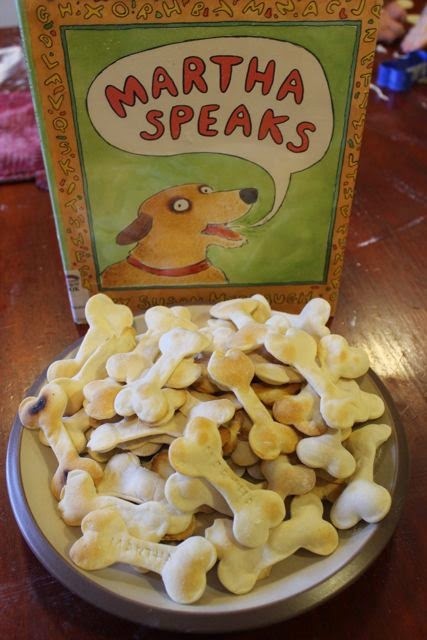 But, I am glad I didn't because the crackers puffed up and looked more like dog bones. 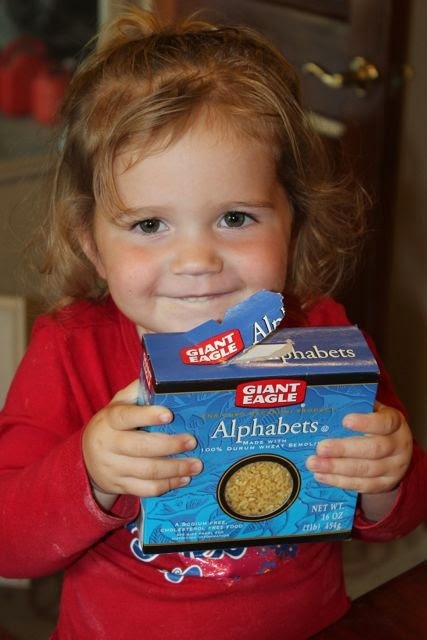 She was excited for the alphabet pasta! A delicious combo -- food and books! 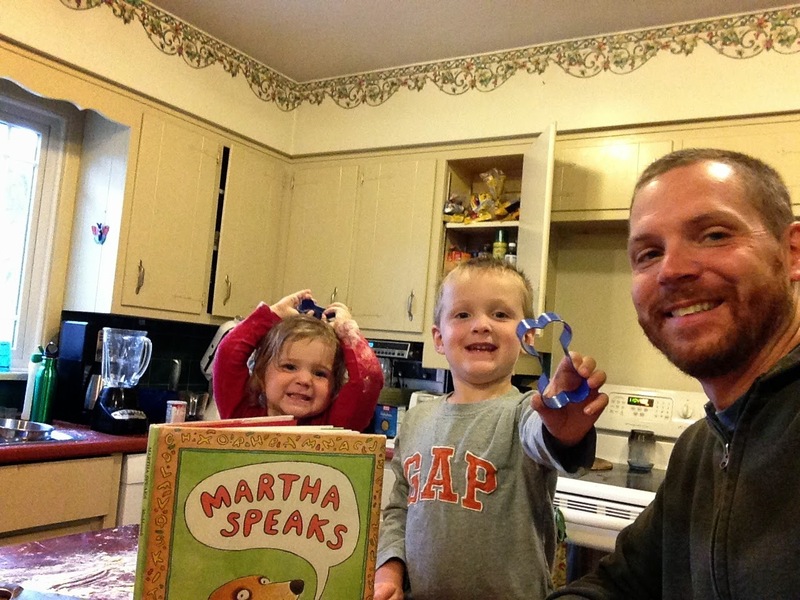 We read 4 Martha books this week; Martha Speaks, Martha Calling, Martha Blah Blah, and Martha and Skits. Thankfully, we read Martha and Skits! My 2 year old daughter was worried that the alphabet soup was going to go to her brain just like Martha! I told her that she didn't need to worry, because Skits ate alphabet soup too and it didn't go to his brain. It only happened to Martha. This calmed her anxiety. Whew! 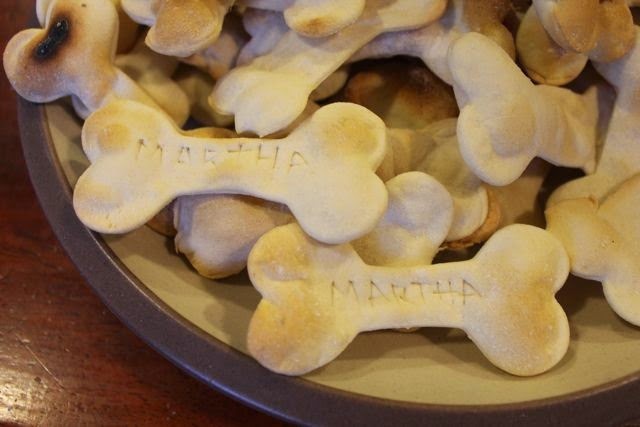 I made a few special crackers with MARTHA imprinted on them. I used a knife before baking to imprint the letters. Grilled cheese too! Do you make your grilled cheese in the oven? A few years ago we discovered that it is easier to make grilled cheese for the whole family in the oven. The birthday boy is the silly one in the green shirt! Happy Birthday, little man! 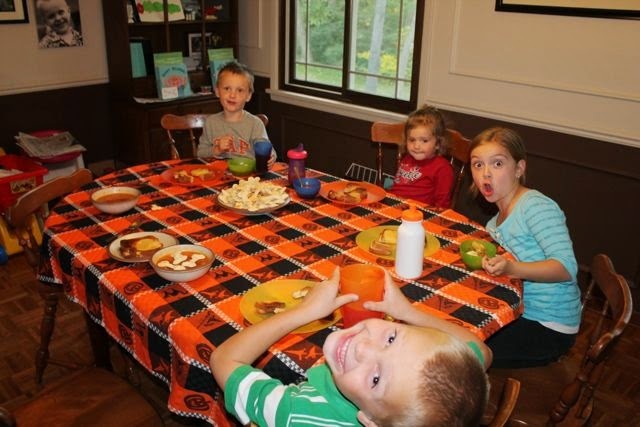 This week when we were putting up our Halloween decorations we found the two haunted house pictures (pictured below). My daughter made them four years ago after we read In the Haunted House by Eve Bunting, illustrated by Susan Meddaugh. It is one of our favorite Halloween books! Click here to read how she made these! In the Haunted House is now available as a Touch-and-Feel Lift-the-Flap book!